This martial arts system that has its roots planted deep in Okinawan history. At one time these islands were known as the Ryu Kyu islands. The name was changed by Japan when it took control of Okinawa. Okinawa means "rope on the horizon", as that is how it appears to be when it is viewed from the air. Today there are many styles of karate. These styles, although related, differ in philosophy, and interpretation of concepts. Karate is divided into 3 categories: Modern, Traditional, and Classical. After 1945 emphasis was placed on karate as a sport; hence modern karate developed. This is seen in many eclectic styles that develop new techniques only for use in sport. Traditional karate developed after the meiji restoration of 1868. A shift from the warrior philosophy was dictated by the Japanese government; therefore, emphasis was placed upon the spiritual and physical development gained by practicing "the way" of karate rather than actual combat applications. Classical Karate developed before 1868, uses actual fighting philosophy developed by the warrior class. Classical karate is real karate technique used to stop opponents in actual combat, not the controlled conditions of tournament play. 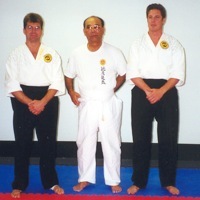 Grand Master Taika Seiyu Oyata, Supreme Instructor, has devoted most of his life to studying and perfecting karate techniques. He was fortunate enough to be able to study with Okinawa's finest instructors. After WWII in 1946, Taika met Uhugushuku Tan Mei (95 yrs. ), a former bushi, who had been in service to the Okinawan emperor. The Uhugushuku family was very famous for their karate and kobudo (weapons). Because of Taika's royal heritage, he was allowed to become Uhugushuku's personal student and trained with him daily until Uhugushuku's death. Mr. Uhugushuku taught Taika fighting theory, history, how to study technique, and the weapons kata used in Ryu Te®.Weapons include: Bo, Jo, Tanbo, Sai, Tonfa Nunchuku, Kama, Eku, Chizikun Bo, Manji Sai, Nunte Bo, Chinte, and surichin. Uhugushuku stressedthe importance of kata as a means to learn and practice technique. He also taught Taika that all kata contained Tuite, And Taika was encouraged to look further into kata to discover their hidden meanings. Because of his abilities, Taika was introduced to other karate masters to further his knowledge. One such instructor was Wakinaguri Tan Mei, a large heavy set Chinese about the same age as Uhugushuku, who specialized in nerve and blood vessel striking techniques; Kyushu Jitsu. Wakinaguri taught him the bodies weak points and vital areas as well as how to strike them. With this knowledge, Taika began to analytically research kata to discover their hidden meanings. After the passing of Uhugushuku, and Wakinaguri, Taika continued his search for knowledge. Because of his family heritage, and his ties to Uhugushuku, he was accepted as a student/ instructor under Shigeru Nakamura. Nakamura was famous for his punching technique, and was responsible for the use of Bogu gear, in the Okinawan Karate Championships. The 12 kata taught are from Nakamura. Although Taika studied kata from others, Nakamuras version of the kata was closer to the original and not affected by modern change. Under Nakamuras direction, Taika developed very strong punching and kicking techniques. In the mid- 60's Taika entered a large tournament in southern Japan, attracting the best karate men from Japan and Okinawa. Taika Oyata at the age of 38, took 1st place and became champion of not only Okinawa, but Japan also. As his search for knowledge continued, Taika joined an analyzing and research group with Seikichi Uehara, the only living student of Choyu Motobu. Uehara is famous for a form of Tuite and weapons fighting that dates back to the 1600's and passed down solely through the Motobu family. Taika began working with Uehara comparing the two systems of tuite and weapons fighting. In the late 1960's Taika became fighting champion of Okinawa with the 6 ft. Bo. Taika has taken the knowledge from all of his teachers, analyzed kata and fighting techniques, and formed his own martial art system.